Living in a city with so many parks provides us with ample opportunities to boost our health through nature. 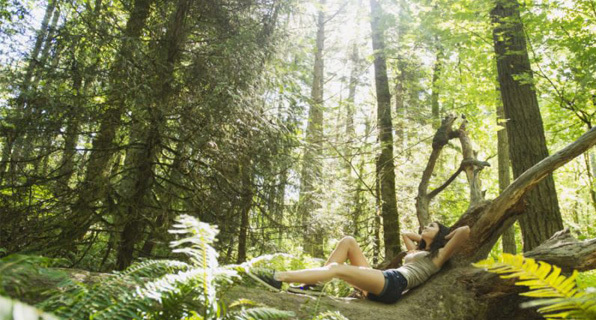 “Forest bathing” is a meditative practice in which we walk peacefully in greenery, taking in the sights and sounds and breathing in the scents. First developed in Japan, this practice, known as Shinrin-yoku, was created to put people back in touch with nature, rediscover its beauty and the importance of its preservation. The healing benefits were quickly recognized. These included boosting immunity, balancing mood and reducing stress. These discoveries have made this valued health practice popular worldwide. In addition to their beauty, studies have shown that trees release compounds into the forest air that are beneficial for us. The aroma of Cedar has been cited as one of the most distinctive. In Japan, scientists found that through inhalation of these tree-derived compounds, known as phytoncides, the concentration of stress hormones were reduced and the white–blood cell activity in our bodies was enhanced. These are both very important factors in our immune function. When we open our senses and experience the sights, sounds and aromas in nature, we are engaging in a form of meditation. Movement meditation is great for those who find peace in action and prefer to let their minds wander. Many think meditation has to be done seated in solitude and chanting. In fact, it can be done anywhere and anytime to help us stay calm and centered. According to the Mayo Clinic, any form of meditation can help us improve our stress management skills, increase our self awareness and reduce the intensity of negative emotions. Next time you are feeling stressed, try slowing down your breathing, and increasing the depth of your respiration and expiration. Try to turn your focus onto something positive. If you are in nature, pull yourself away from the distraction of your busy mind and back to your surroundings. This practice is not only relaxing and comforting, but it will also rejuvenate your body and mind and restore your inner peace. © 2019 HEALTHWINDS SPA. All Rights Reserved.